It was a busy and successful week for Sleaford Town Bowls Club, with five wins in six matches played. Visiting North Hykeham in the EBA League, Town had only one winning rink out of three but it was enough to secure overall victory 52-41. Neil Mapletoft’s set of Cecilia Faulkner, Peter Stokes and David Campbell won 24-9, while John Parker, Ken Dye, Ken Irwin and Trevor Cope lost 12-14, and Andrew Bird, Andrew Morris, Mick Faulkner and Kris Moore also 16-18. At home to St Giles in the City League, Town won on all three rinks to pick up 10 points with an aggregate 65-44. Trevor Cope’s set of John Parker and Neil Mapletoft won 26-9 win, Kris Moore, Roger Neaverson and Andrew Bird won 18-16, Martin Titley, Richard Barnes and Paul Jobson won 21-19. The one defeat of the week came away at local rivals Ruskington in the District League Hospital Cup, with Town losing 58-35. Sleaford’s only winning set were Mick Jarrald, Calum Campbell and Ken Irwin, 15-13, with Robin Wilson, Ken Dye and Kris Moore losing 12-17 and Jackie Wareham, Gillian Annison and Bas Gilbert losing 8-27. That same evening, at home to Harby, Town won their City League Handicap Cup game in which Sleaford were giving away 30 shots to their visitors. But they easily overcame the handicap, winning 124-34. Martin Titley, Roy Markham and Trevor Cope won 51-8, Ruth Bird, Roger Neaverson and Andrew Bird won 42-11, John Parker, Julie Cope and Neil Mapletoft won 31-15. Entertaining Sleaford Bristol in the Wednesday Afternoon League all three Town rinks won for a score of 59-45, with Town taking six points. 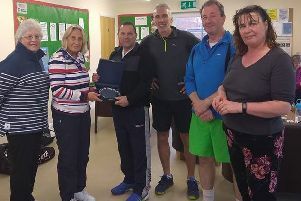 Joan Gilbert, Clive Steadman and Ken Dye won 24-16, Jackie Wareham Bas Gilbert and Ken Irwin won 20-15, Robin Wilson, Brian Srawley and Mick Faulkner won 15-14. Town played Sleaford Bristol again in the Sleaford League Knockout Cup on a ‘two home/two away’ format and again came out on top. Playing on the Bristol green, Cecilia Faulkner, Gillian Annison and Mick Faulkner drew 15-15, while Clive Steadman, Bas Gilbert and Ken Irwin won 26-9. At home, Mick Jarrald, Brian Srawley and Gwen Campbell won 26-11, and Ruth Bird, Joan Gilbert and Julie Cope lost 18-19.